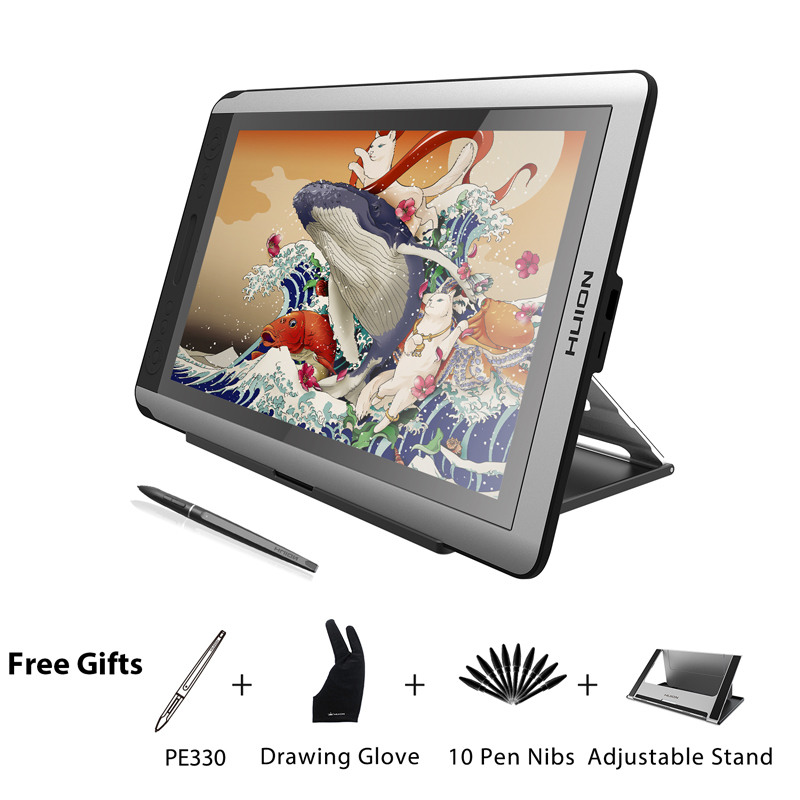 Huion Kamvas GT-156 HD V2 is a new, upgraded version of popular graphics tablet that allows digital painting, architectural drafting or webdesign directly on a large 15.6 inch touch screen. This is the artist tool that will find its place in every atelier and combines the advantages of working in a digital environment with traditional media like paper and pencil. 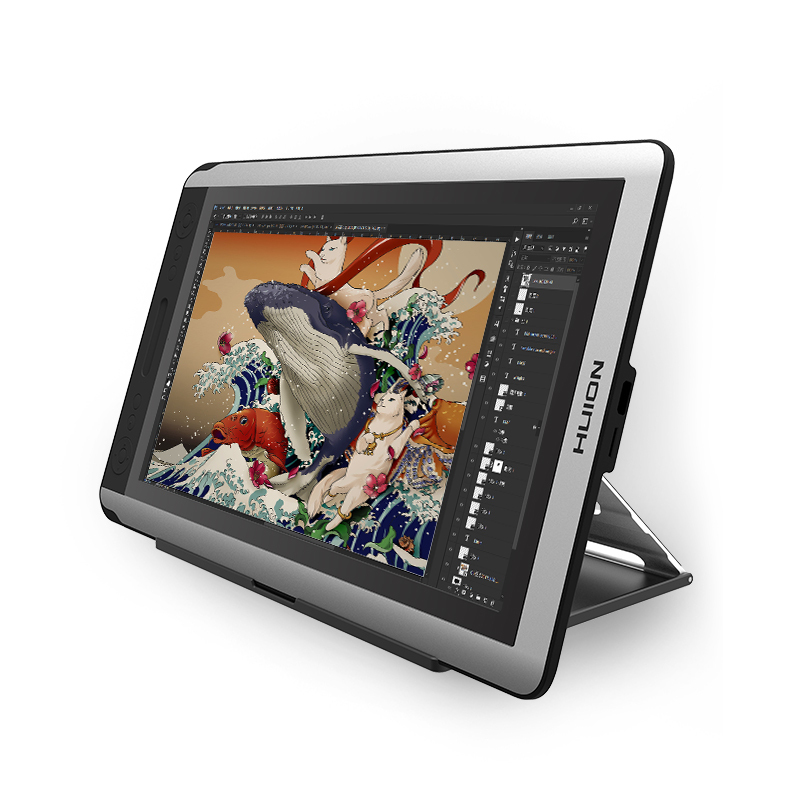 Unlike older graphics tablets, this one allows drawing directly on the surface of a large 15.6-inch touch screen that displays in 1920 x 1080 px resolution. Its color palette covers 72% of the NTSC hues and it’s quite standard for similar tablets. 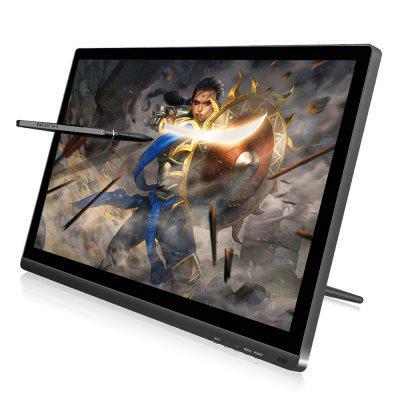 The screen is covered with matte surface and does not reflect light, so you can easily work in direct sunlight and it’s suited to artist’s work with high contrast and instant refreshing rate. Brightness and gamma midtones can be adjusted using the OSD menu straight from the tablet and additional tweaks are available on the software. 8192 pressure levels detected by the active pen enable very precise work, which is further improved by the fast response time with an imperceptible 30 ms delay. The pen has an 80 mAh battery and is charged via USB. In addition to the touch screen, there are a total of 14 buttons on the left side and one vertical touch bar that allows you to smoothly adjust brush size, layer transparency or other continuous settings in the graphics software. The buttons are comfortably large, and each key can be bind to a keyboard shortcut, so the GT-156 HD V2 can be personalized to suit your needs which immensely speeds up the work in comparison to just keyboard + mouse combo. CD included in the box contains software and drivers that allows you to connect the tablet to work with popular graphics software for Windows and Mac: Photoshop, AutoCAD, Adobe Illustrator Inkscape and more – basically every major graphics suit is covered and you can find compatibility list on the manufacturers website. GT-156 is extremely thin and really light considering this is 15” gear and you can use it in normal (flat) mode, as well as in “tent” form, with two different angles: 20° & 50°. Weighing just 1.5 kg, it’s easy to pack it up and take it anywhere with you. Besides pen, box includes eight spare nibs, a cleaning cloth, 3-in-1 cable, and nib clamps that can be stored in an included pencil case. The tablet is connected to the computer via the HDMI port, so be aware that if you work on older PC that has only VGA video output, you won’t be able to actually plug it in. The Japanese Wacom still dominates the market when it comes to digital drawing tablets, but if you’re looking for this kind of artist’s tool for half the price, Huion is a great choice. Kamvas GT-156 V2 is in no way inferior to the Wacom flagships, allows for extremely precise work, has a responsive pen and a sensitive display, so it’s suitable for both professional (like architecture, CAD, webdesign) and hobby applications in school or at home. No wonder it’s one of the Aliexpress bestsellers!